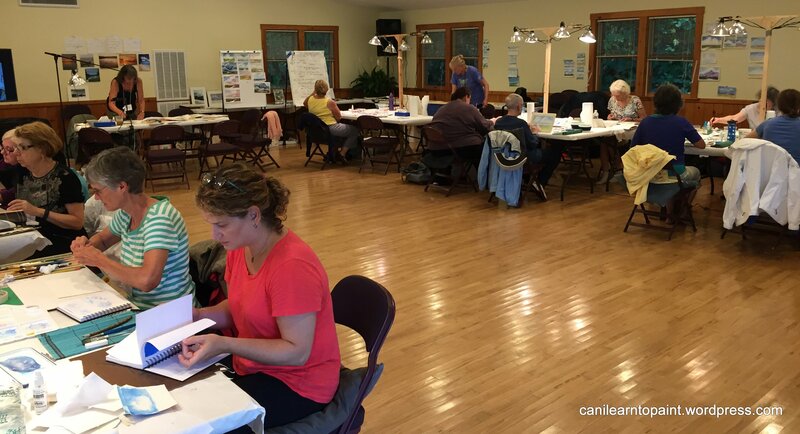 I recently attended a 5-day watercolor workshop at Omega Institute in Rhinebeck, NY. This was my second watercolor workshop at Omega led by artist Ann Lindsay, an incredible artist and teacher. The class was specifically on painting landscapes. Ann calls herself a “representational landscape artist,” which means that what she paints is intended to represent the scene, not exactly replicate it like a photograph or loosely suggest it like an impressionistic painting. I love Ann’s teaching style. She very much emphasizes the process rather than the product. And as an artist who struggles with getting caught up in my attachment to the end-product, I can never get enough training staying in the present. As Ann says (and she may have been referencing another artist when she said this), painting is both a noun and a verb. When we see “painting” as a noun, our left brain takes over and tries to create “A Painting.” But when we see “painting” as a verb, our right brain is freed to take over the creative journey and paint what is. This distinction really resonates with me. 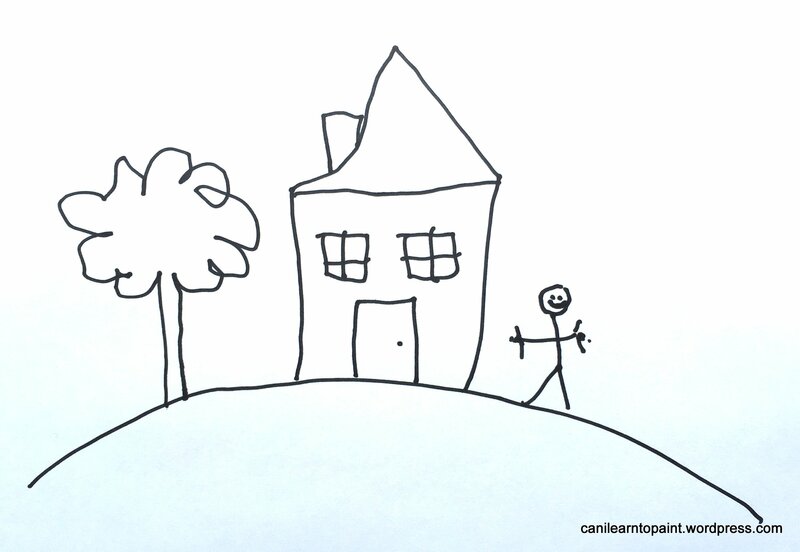 But a house ends up being simply a combination of colors, values, and shapes. And if you’re in your right brain, that’s how you see it and that’s how you’ll paint it. Left brain labels and then takes over (and you end up with Mr. House). Right brain observes and sees what is (i.e. colors, values, shapes). We began the workshop by playing with the first of these three elements: color. As most people know, there are three primary colors: red, yellow, and blue. Every other color in the spectrum is made up by mixing these three colors. Mix blue and yellow and you get green. Yellow and red and you get orange. Red and blue and you get purple. Mix all three primary colors and you get… MUD. Yes, mud. I am very familiar with this phenomenon. 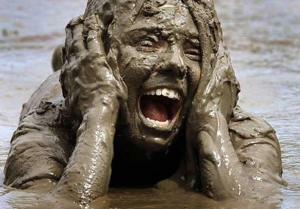 And this is how I feel when my colors mix into mud. 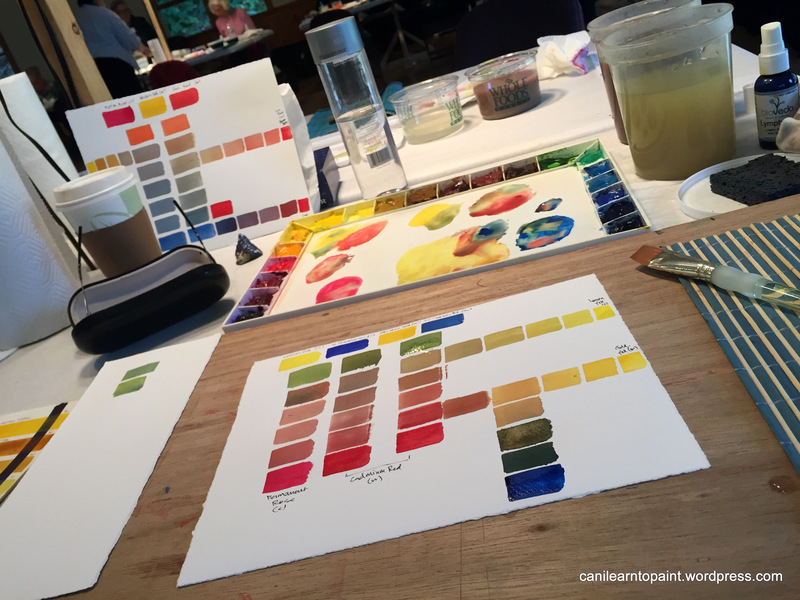 To become comfortable with mixing colors, Ann had us do an exercise she called “going into the mud and back out again.” To do this, we started with two primary colors. In the case of the picture below, it was yellow and red (I tried out two different reds – Permanent Rose and Cadmium red). I first mixed them together to get orange. Then I added very small amounts of blue to the orange (Windsor Blue in this case). As you can see, orange quickly goes to mud when blue is added. And then as I added more blue, I slowly came out of the mud. I branched off a couple of times to the left and the right to see what it looked like to come out of the mud into the other colors. Seems simple enough. But Wow, what an enlightening exercise to see how you can very easily make mud (which can sometimes be useful) and then go from mud back to a color. But that’s not all, folks. Unfortunately (for those of us who want life to be simple), it gets more complicated. As it turns out, each primary color has two different shades. Yellow can have a blue shade or a red shade. Red can have a yellow shade or a blue shade. And blue can have a yellow shade or a red shade. 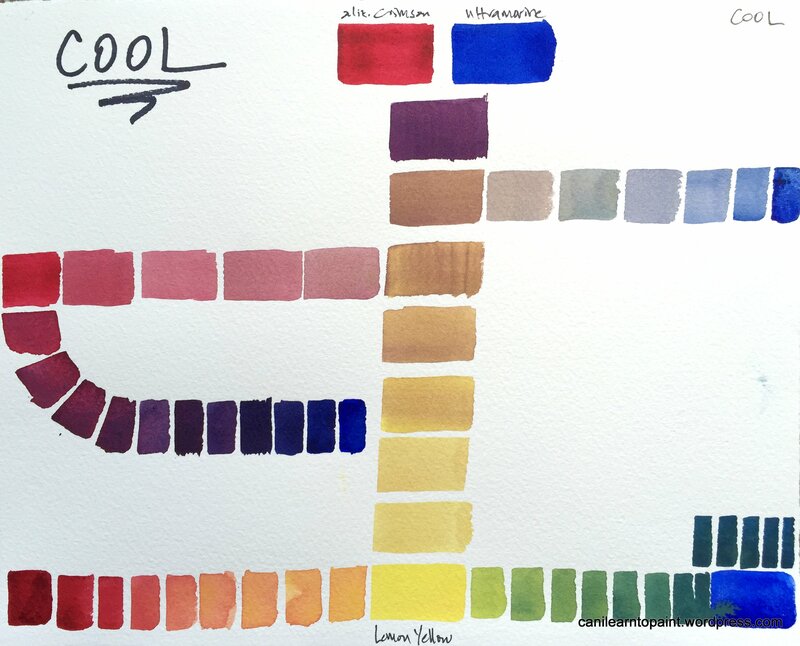 These two shade types are sometimes called cool and warm. A warm blue has a yellow shade (Thalo Blue, for example). And a cool blue has a red shade (Ultramarine Blue, for example). The table below illustrates warm and cool shades of the three primary colors. Who cares, right? Well, if you’re trying to get a very specific kind of green (a spring green, for example), you very much have to care, because if you mix a cool blue with a warm yellow, you’ll get a muddy green (because there’s a red shade in both the cool blue and the warm yellow). Mixing a warm blue with a cool yellow will give a purer green (because there’s no red shade in either). 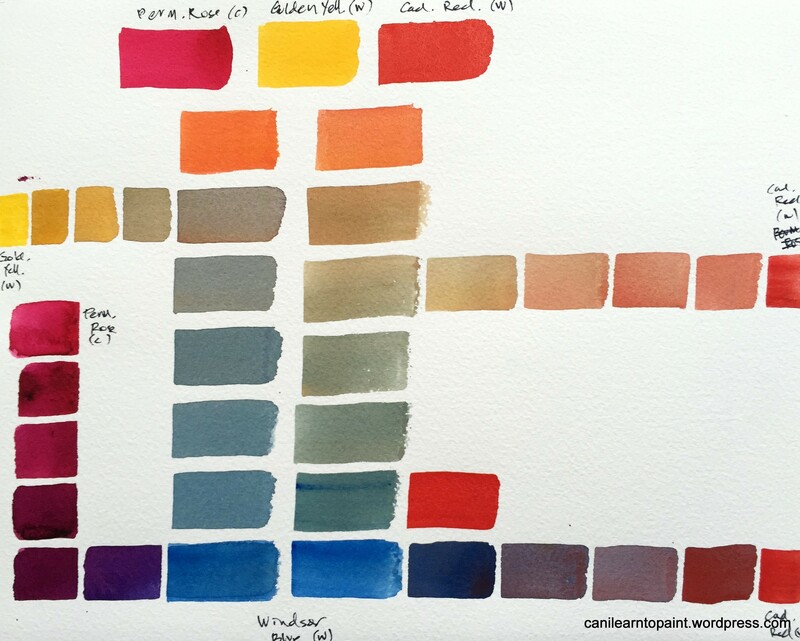 It’s very interesting to look at the various combinations and notice which feel “muddier.” The central column of colors in each study shows the mud that’s created by each primary color combination. I think I’m more drawn to the warm mud, myself. 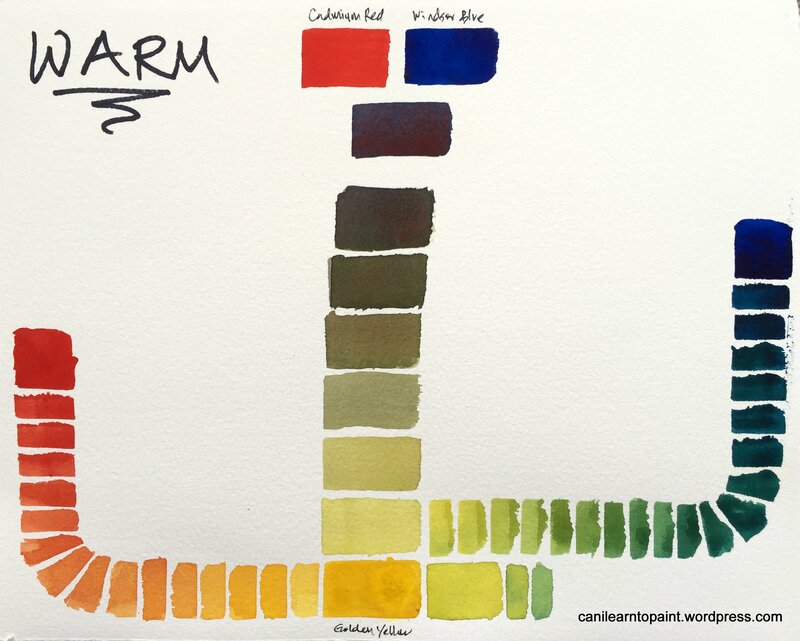 I really got into mixing colors, and as a final study, I decided to see the full spectrum that comes from mixing the warm primaries in my pallet: Cadmium Red, Winsor Blue, and Golden Yellow. In making each box between the circles, I started with the lightest color (e.g. yellow), creating a good-sized puddle of it in my mixing tray. Then I added the darker color bit by bit. 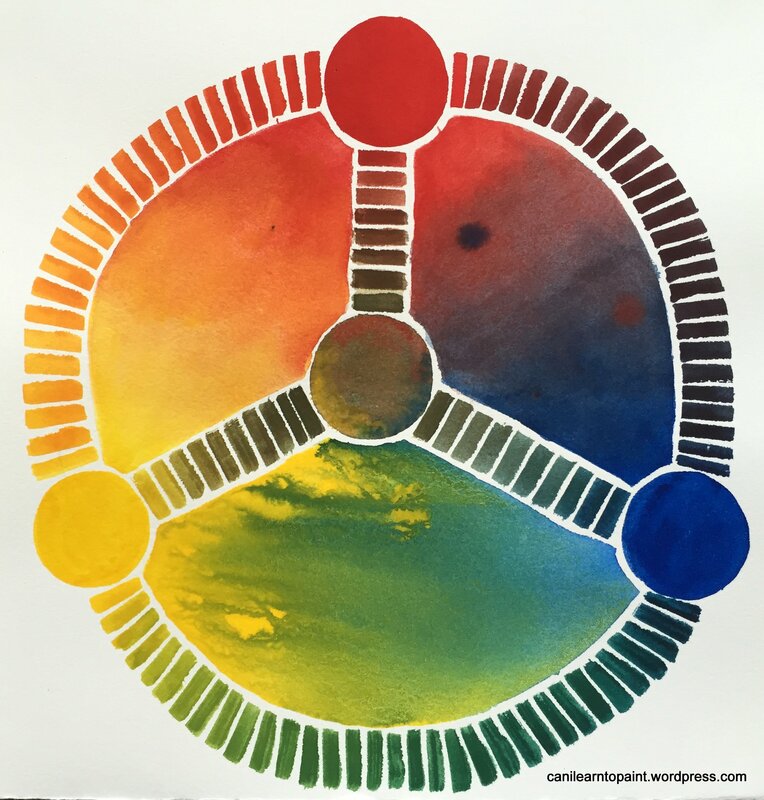 The circle in the center shows the particular mud that emerges when these three primary colors are mixed. For the yellow-blue, I first painted a graduated yellow wash, and then while it was still wet, I dropped in blue on the right and turned the paper to let gravity do the mixing. For the yellow-red, I first painted a graduated yellow wash, let it dry, then I painted a graduated wash of red over it. For the red-blue, I first painted a graduated red wash, then I painted a graduated blue wash over it, wet in wet. I dropped in a pure blue circle on the red side and a pure red circle on the blue side while the wash was still wet. I noticed that all of these color mixing studies gave both my right and my left brain something to do. My right brain was able to observe what emerged when different colors interacted. And my left brain was able to dig into the precision and structure of each study. I found it very relaxing, especially the process of morphing from one color to another by starting with a pure shade of the first color and adding very small amounts of the second color with each new stroke of the brush. There are few things better than sitting in a painting workshop with fellow artists, a latte, paints, brushes, and paper. And to do that 5 days in a row in a retreat setting is simply delicious. Ahhh…. Gorgeous studies and thank you so much for this important information! I never knew you could go out of the mud. Great stuff here; thanks! Thank you for stopping by, Laura! Yes, who knew that you can un-mud a muddy mix?? Nice palette work, David! This looks like a very informative workshop! It’s been a while since I’ve painted with an academic context…a little refresher would probably not be a bad idea for myself!